After just three months of marriage, Katy Perry and Russell are seeking couples therapy to help smooth over troubles in their marriage. 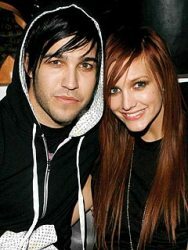 And after just two and a half years of marriage, Ashlee Simpson has filed for divorce from her husband, Pete Wentz. Nothing surprises me in "HollyWEIRD." Russell Brand is an irritant and i'm sure Katy is fed up of that side of him.